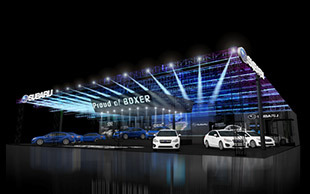 Tokyo, December 24, 2015 – Fuji Heavy Industries Ltd. (FHI), together with Subaru Tecnica International Inc. (STI)*1, announced its exhibition at the upcoming Tokyo Auto Salon 2016 with NAPAC (Japan Car Parts and Aftermarket Promotion Association), which will be held January 15th to 17th, 2016 at the Makuhari Messe in Chiba prefecture. At the Subaru booth will be concept models such as the “STI Performance Concept” which signifies STI’s core business areas, “Levorg STI Concept” and “Subaru XV Hybrid STI Concept”. The “WRX STI NBR Challenge 2016”, a racing car for 24 Hours Nurburgring endurance race in 2016 and the “Subaru BRZ GT300 2016” for Super GT race will also be exhibited. At the press conference on January 15th, 2016 Subaru Motorsport Activities will be announced. The special site for Subaru Auto salon (http://www.subaru.jp/tas2016/) will be opened. By using the USTREAM (http://www.ustream.tv/channel/subaru-ustream)*2 live streaming provider, events in the Subaru booth will be broadcasted live. *2: Ustream is a live video streaming website operated by Ustream Asia Inc..
STI Performance Concept signifies STI’s core business areas; aftermarket parts, complete cars and motorsports. Featuring STI technologies and components including STI suspension and brake enhancements as well as other exterior and interior upgrades, the concept cars showcases STI’s key business areas of aftermarket performance parts and complete cars. 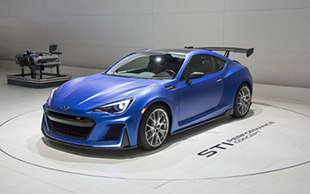 To signify STI’s commitment to motor sports, it employs the STI-tuned EJ20 horizontally-opposed 2.0-liter four-cylinder turbo racing engine currently used for the Super GT race in Japan. The “WR Blue Pearl” colored Levorg STI Concept employs exclusive front fascia with quality feel and STI-designed 18-inch aluminum wheels, offering stylish design. Its red-wine and black two-tone color interior features high-quality feel with exclusive accessories. By employing exclusive STI-tuned dampers, superb ride quality, stability and exhilarating handling performance have been delivered. The Subaru XV Hybrid STI Concept harmonized Subaru XV’s “casual & sporty” character with STI brand’s sportiness. With orange-colored accents on “Quarts White Silica” exterior color, its active and sporty image has been further enhanced. Its interior has also been accentuated by orange and beige color. In addition, by employing STI sports parts, superb ride quality and stability have been achieved, enhancing Subaru hybrid model’s fun to drive character.